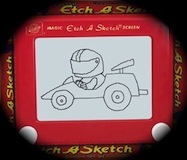 You remember the old Etch A Sketch you had as a kid? What if you could relive that in digital glory on your widescreen TV? Well now you can, well, vicariously through me... 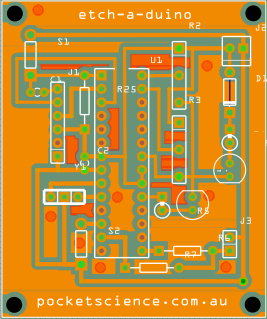 So I thought it would be a pretty simple thing to build, and might be fun for the kidlets at the same time. 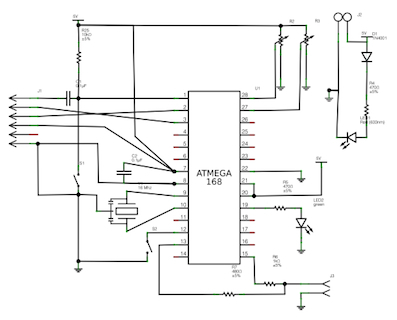 Step one involves designing the circuit. 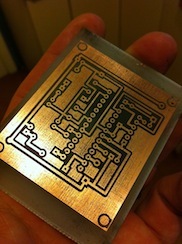 Again I used Fritzing and built on from the original PCB I designed for testing the home brew PCB etching system. 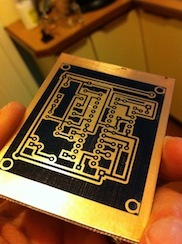 Next I printed the PCB layout on photo paper, applied that to my copper clad board then ran it through the lamintor a few times as previously described. 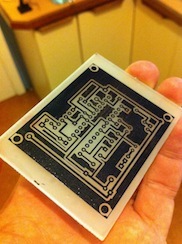 Once that is done I etched the PCB with ammonium persulfate and hand-drilled the holes.